For using the maximum power of your mirrorless camera, the FUJIFILM NP-W126S Li-Ion Battery Pack has been designed to better manage heat and ensure lightning fast camera performance. This battery is also compatible with older cameras that use the NP-W126 battery pack, but users will not see any performance advantages in those bodies. NP-W126S Li-Ion Battery Pack is rated 4.6 out of 5 by 113. Rated 1 out of 5 by smh272 from Power at what price? Ridiculously expensive, these are, and, **based upon price only**, is why only a 1 Star rating. In any case, how can I rate these on performance unless I do involved and technical performance testing? 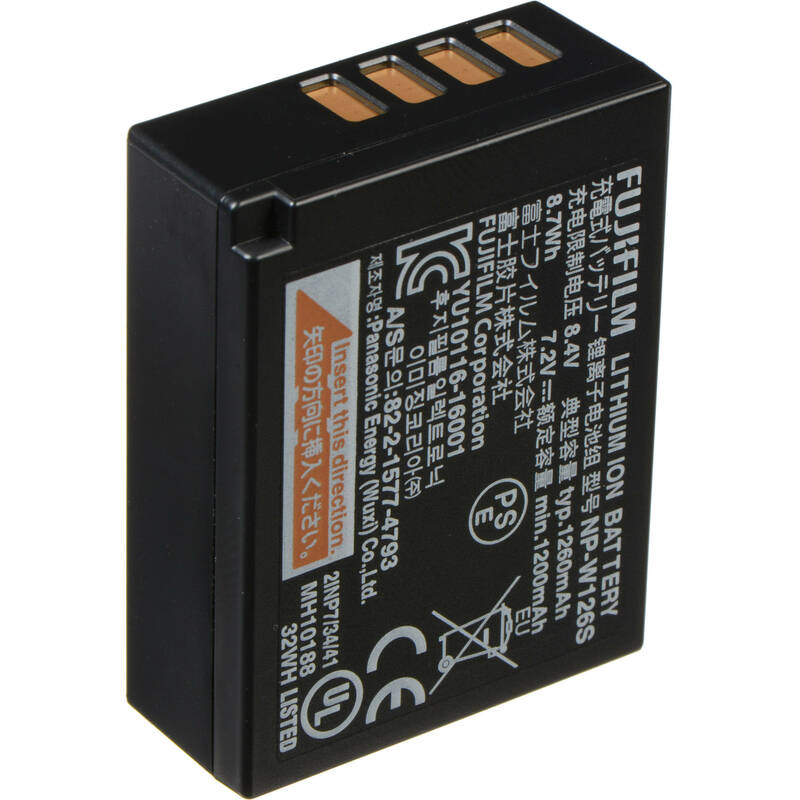 The question is, is a Fuji-branded (OEM) battery deserving of it's absurd price? My gut, and 45 years of techy background, tells me no. That being said, yes, I did take the factory recommendation and buy two of these buggars -but it was purely for warranty considerations. Bottom Line: For the price differential between this OEM battery and aftermarket 3rd-party offerings, I'll take the chance. Next time. Rated 4 out of 5 by pcmofo from Necessary I bought 3 of these for use in the X-T2 with the boost grip. It turns out that you only really need these official fuji new batteries inside the camera itself. The grip is external and can use any of the older X-T1 batteries or aftermarket versions. I'm shooting 4k so I need them. I wish fuji made smarter batteries in general but the X-T2 seems to do a much better job at estimating the charge level left. I'd pick up a spare to go along with the one that came with the camera to shoot 4k. Beyond that I would use any compatible battery. Rated 4 out of 5 by Robert from Worth the cost? I purchased 3 of these to go along with my XT2. My first experience with the camera was 3 days shooting auto races in 90-100 degree heat.. The battery did seem to operate cooler than the previous version but not significantly. However I did not shoot a lot of video to really tax the batteries. In short, if you are not going to shoot a lot of video not sure the batteries are worth the additional cost as I didnt see any significant increase in number of shots I could take. Rated 5 out of 5 by Anonymous from Pricey but effective After trying some third party batteries that last for sixth months, I'm sticking with Fuji from now on. Expensive, but they last. Rated 5 out of 5 by mmauldin from Very reliable I've been using the Fuji batteries with my X-T2 now for several weeks and have been pleased with their reliability. I have heard some comments about the X-T2 going through batteries quickly but have found this not to be excessive. I load a fresh battery before each outing and usually have one spare in my pocket and have yet to run out of power. Rated 5 out of 5 by LUCIANO S. from Better than the generic ones I've purchased 2 of those for my VPB-XT2 and they work great -- no heat issues, no fast discharges. Rated 5 out of 5 by Allen from Fujifilm W-126S Li-ion Battery Pack First, Fuji recommends using their OEM equipment hence I purchased the W-126S from B&H. The Battery charged right up. I put it in the camera and it worked as advertised. As for purchasing from B&H, I buy most of my photographic equipment, plus other equipment from B&H. Unless you buy something inexpensive - and I usually buy two or three things at a time -- there is no charge for shipping. Nor is tax charged. Both of these save a few dollars and over time, that adds up. I've never had to return anything to B&H and I've recommended them to many others, who have purchased equipment from them. As for the battery, it is as advertised, was shipped quickly and in perfect shape. I highly recommend B&H. Can use on Xpro 1 ? If I get the NP-W126S for my X-Pro2, will I get improved battery life over the NP-W126 that came with the camera? My experience is that the NP-W126S did shoot for longer in my XT-2 than the standard NP-W126. I have found the standard NP-W126 and the aftermarket Wasabi batteries are very close in shooting length with a little advantage to the Fuji brand. I also have had a XP-1 for several years. Will this be compatible with the xt30? Does this work for the X-T3 as well? Yes. It says so under &quot;Overview&quot;. Can i use this on x-t1? Yes you can. NP-W126S has a better heat dissipation than the one without the 'S'. What battery does the X-H1 use? NP-W126S Li-Ion Battery the old one 126 will also work but 126S are best. What does Battery Pack mean? What else does it include?